Could WordPress.com Create a Disqus Killer? Since I converted from TypePad comments to Disqus last August, the number of comments I regularly get have gone up by a factor of at least five and maybe ten. It seems that each week I have a post that gets over 100 comments (not this past week though). That never used to happen. And the discussions in the comments have improved dramatically. I’ve been talking with Toni Schneider, CEO of Automattic (the folks who run my blog) and they are looking at a raft of things to do to make commenting better for WordPress.com users. So, let the commenting wars begin! Scoble’s update is intriguing. Commenting wars? Might WordPress.com have something in the works that could undermine Disqus? You can create an RSS feed for your disqus comments, and pipe that into FriendFeed. Vastly increases the social nature of blog comments. Four comments, across four different blogs. Really nice to see that. You’ll also see a couple people that I’m following, on the left hand side of the disqus profile. As a commenter, you can extend your conversation outside the blog. Notice the ‘Likes’ and Franklin Pettit’s comment. 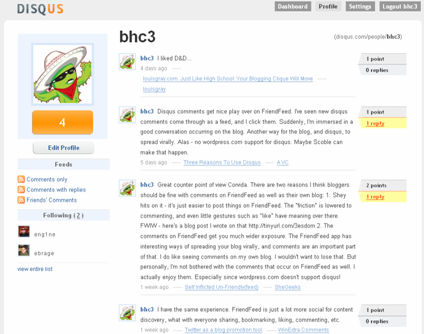 And as a blogger, all the conversatin’ showing up in FriendFeed gets your blog post much more play. Alas, disqus is not enabled on WordPress.com. Which brings us to Robert Scoble’s update. Sounds like the folks at Automattic aren’t sitting still. And that could be bad news for disqus. Why? On disqus’s site, they say that over 4,000 blogs are using their commenting service. 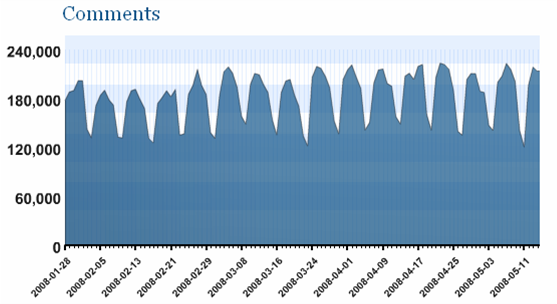 Fred Wilson said it was over 10,000 blogs using disqus. Neither number compares to all the blogs hosted by WordPress.com. Imagine if a lot of those folks streamed their comments into FriendFeed. The viral nature of FriendFeed would be an accelerator on that volume. A WordPress.com commenting system would dwarf disqus. WordPress.com has the built-in advantage of already hosting millions of blogs and comments. Disqus is still in its infancy in acquiring new blogs. If Automattic is serious about this, they should enable a new commenting system to work on non WordPress.com blogs as well. As a blog reader, once you have a profile set up, you’d like to use it everywhere. Disqus has done an amazing job of customer service so far. That’s worth a lot of goodwill right there. I also love the upstart companies who show the world new ways of doing things. And who knows? Automattic might be thinking of integrating disqus as one of the “raft of things to do to make commenting better for WordPress.com users”. I know I’ve requested the addition of disqus.